In a Nutshell: Shopping for a home loan can be a confusing and frustrating experience, and most people are never sure they’ve gotten the best terms and rates available. Founded in 2015 to add transparency to the lending process, HashChing is Australia’s first online marketplace for consumers looking to buy or refinance a home. Using a network of verified and experienced broker partners, HashChing can get homebuyers the most favorable loan rates and terms in the marketplace at no additional charge to the consumer. Do you ever get the feeling that rich people receive better treatment than the rest of us? For example, if a rich person requests a loan from a bank, they’re offered the best rates and most favorable terms. Why is this? It’s because the bank views them as a less risky, higher-volume customer and wants them to continue doing business there. For the rest of us, however, banks are more likely to see potential liabilities and base their loan decisions on factors like our incomes, credit scores, and even where we live. Based on this increased risk, we’re unlikely to get the same favorable terms as those approved for people with more money and pristine credit scores. But what if we could change this paradigm? That’s exactly what HashChing, Australia’s first online marketplace for home loans, has set out to do by offering individual borrowers loan rates usually reserved for the most elite clients. HashChing uses a network of experienced and verified local mortgage brokers to negotiate the best possible rates from lenders, and to pass those savings on to homebuyers. It’s like having the resources and clout of the wealthy, without having all of the extra zeroes in your bank account. To find out more about how this unique platform works for Australian homebuyers, we recently spoke with Siobhan Hayden, Chief Operating Officer for HashChing, who shared some insights on how HashChing’s broker partnerships benefit consumers. Siobhan told us HashChing Co-Founder and CEO Mandeep Sodhi was inspired to start the company from his previous experience working for a bank. He needed a mortgage and thought he had been given the most favorable rate offered by his institution. However, when a friend, Atul Narang, received a better mortgage rate from the same bank through a broker, the experience led the two friends to start HashChing in 2015. HashChing is devoted to getting Australian homebuyers the best rates possible on their mortgages. But what if they already own a home? Many consumers find themselves with mortgage rates that are too high and payments they can barely afford. Well, HashChing has a solution for these folks, too. HashChing created the GroupBuy Refinance program to help Australian homeowners refinance their mortgages at group rates. By joining together and offering their mortgages as a bundle, lenders are more likely to offer a discounted or preferred refinance rate to the entire group. Siobhan further explained this revolutionary idea. As with a group of friends chipping in for a more expensive wedding gift, pooling resources has its advantages in mortgage rates. We wanted to know how HashChing creates these groups, and who can join. More than half of Australian homebuyers — between 53% and 56% — choose to go with a broker rather than directly with a bank, Siobhan said. One of the primary reasons for this is the ability of brokers to negotiate discounted rates due to the volume of business they do with a lender. These lenders know that a broker is likely to bring them repeat business, and, therefore, will offer their best rates right upfront. HashChing partners with the most experienced and qualified brokers in any given area. These local and verified broker partners are able to leverage their resources and offer consumers more choices and better rates. This is obviously a great advantage for borrowers, but these relationships with HashChing also benefit the brokers. When a broker wishes to join the network, HashChing will first vet them and verify their qualifications. Once onboard, brokers can expect to receive plenty of qualified leads through the HashChing network, but that’s not all they get from this partnership. HashChing helps connect borrowers with local mortgage brokers who can help them find better rates. From its inception, HashChing has been a FinTech company, with tools and processes that make mortgage lending easier. One way HashChing does this is through the use of an automatic document upload tool. Another great piece of technology for brokers is HashChing’s performance-enhancing dashboard, with features and technology that brokers would not have access to on their own. This interface includes features like success rate metrics, performance analytics, a virtual verification of identity tool, and automated follow-up reminders. It’s all part of HashChing’s advanced technology toolset for brokers. Sometimes borrowers may want to ask questions about sensitive topics, like past bankruptcies, divorces, or even how much they need to have in their bank accounts. HashChing’s Ask a Broker feature allows consumers in this position to ask scenario-based questions anonymously. 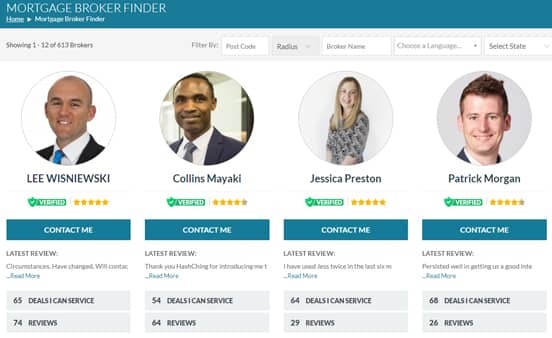 The beauty of this system is that brokers are encouraged to be responsive and descriptive in answering inquiries, which tends to improve their chances of having a client choose to work with them over competing brokers. HashChing believes the more educated and informed a borrower is, the smoother the entire process works. The HashChing portal also lists commonly asked questions with answers from the experts. HashChing began operations in 2015 with just nine broker partners. After two years in the market, more than 700 brokers have joined the network, which has seen more than $13 billion in loan applications. While HashChing is strictly an Australian service for now, some very preliminary discussions have taken place over possibly expanding into Singapore. And Siobhan told us that by 2019, the company hopes to have other operations around Asia. As for the company’s impact on the Australian mortgage marketplace, that’s been quite a success story. More than 25,000 customers have come through the portal, and countless others have visited the site to gather valuable educational information on mortgages. Whatever plans the company has for growth and expansion, the future certainly looks bright for Australia’s first online home loan marketplace.